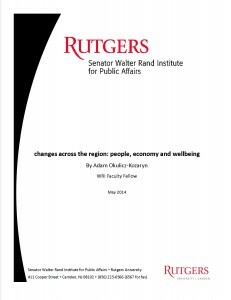 Dr. Adam Okulicz-Kozaryn’s paper focuses on the demography, economic state, and overall health of the eight-county South Jersey region. Using public data from the Census Bureau, Department of Labor, and numerous other sources, Dr. Okulicz-Kozaryn paints a vivid picture of the strengths and weaknesses of each county in South Jersey through a series of complex charts and tables. He concludes his paper by stating that South Jersey’s strength lies in its agrarian roots which led South Jersey’s counties to be far less densely populated than their northern counterparts and more appealing to new homeowners and industries based on the availability of land. This page was printed from http://rand.camden.rutgers.edu/2018/01/09/changes-across-the-region-people-economy-and-wellbeing/ at 8:34 PM Saturday, April 20, 2019.